The year is 1935: in Nazi Germany, Adolf Hitler has reinstated the Luftwaffe, violating the 1919 Treaty of Versailles. It is at this time that 14-year-old Ivor Lloyd Rooney joins the Queen’s Own Rifles of Canada Bugle Band to pursue his love of music. The Queen’s Own Rifles of Canada Bugle Band is over 100 years old and continues to play at concerts and ceremonies to this day. Three years after joining the band, Ivor enlisted with The Queen’s Own Rifles of Canada battalion as a foot soldier and joined WWII. Ivor trained at Camp Borden, ON, and later went on to Botwood and Gander, NFL, and Sussex, NB. His regiment's first assignment was the defense of Newfoundland and New Brunswick. In July 1941, he and the regiment were posted to England as a part of the 8th Canadian Infantry Brigade of the 3rd Canadian Division. The Queen's Own Rifles’ first action was in the leading wave of the D-Day invasion. The regiment landed on Bernieres-sur-Mer, codenamed “Juno” beach. Due to submerged mines, 30 per cent of the landing craft at Juno beach were destroyed or damaged. The Queen’s Own Rifles took heavy casualties during the first few minutes of the battle, suffering 143 casualties, more than any other battalion. Ivor, who was 23 at the time, survived. The fighting took him and the regiment through Normandy and into Northern France and later into Belgium. Throughout the war, Ivor corresponded regularly with Margaret, who he’d first met when he was 16. When he returned home from war in 1945, they became engaged, and the young couple married a year later in 1946. In 1952, they had a daughter, Diane, and in 1953 they moved into their home in Toronto, which Ivor meticulously maintained for over six decades. weekends all throughout the 1950s, helping out at his brother’s grocery store. He and Margaret remained married for 68 years, until Margaret passed away in 2014. 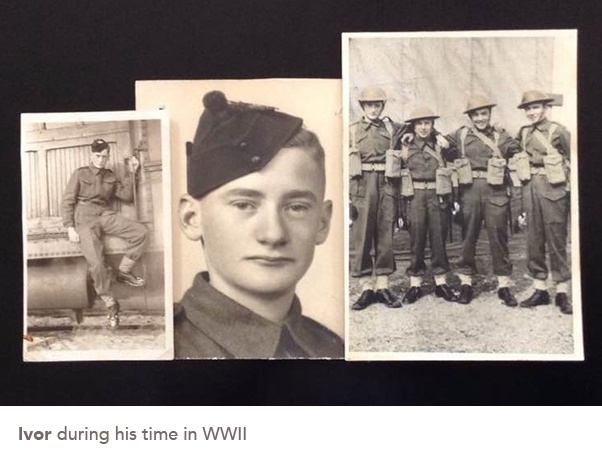 Throughout his life, Ivor remained connected to the Queen’s Own Rifles of Canada. In the 1970s, he and his wife travelled with them back to England, France, and Holland for a reunion. He was a long-standing member of the Queen’s Own Rifles of Canada Bugle Band, practicing with them well into the 1980s. It was around that time that he exercised his passion for music by writing and recording a march with the help of a family friend. From planning celebrations to discovering new outings, recreation team members truly get to be the life of the party. The Quality Work Life Committee at Sienna spreads joy to team members through fun activities and events. They’re an essential part of everything we do. 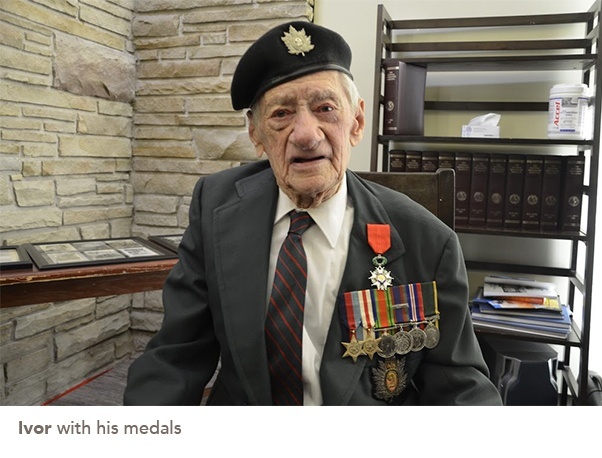 103-year-old WWII veteran and survivor of both the Halifax Explosion and Almonte Train Wreck shares his story.